A new 22-watt laser has now been accepted from the system supplier TOPTICA and its partner MPB following nearly five years of sustained collaboration and effort (see ann1045, ann1048, ann11039, ann12012 and ESOcast 34). 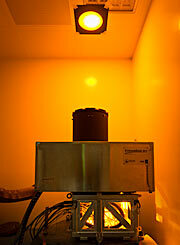 This laser system will form part of the Adaptive Optics Facility at ESO’s Very Large Telescope (VLT) . This laser, and four further similar units (including one spare) that will be delivered later, constitute key elements of the new facility and this acceptance marks a major step forward for the project. Five years ago the options for obtaining high power, reliable lasers in a compact format suitable for the requirements of the Adaptive Optics Facility were very limited. But now new technology and dedicated research and development have changed the landscape. After three months of acceptance testing at ESO, the project team was very happy with the performance of the new hardware, which holds great promise for simple and stable operation on the VLT in the future. This is crucial because these lasers will be used every time an observation is taken with the Adaptive Optics Facility. The new laser design also benefits from a special technique aimed at enhancing the brightness of the artificial guide star generated in the sodium layer 90 kilometres up in the atmosphere ; this is a unique feature never routinely used so far in a major observing facility. The Adaptive Optics Facility uses sensors to analyse the atmospheric turbulence and a deformable mirror integrated in the telescope to correct for the image distortions caused by the atmosphere. But a bright point-like star needs to be at hand in order to measure the turbulence, and this needs to be very close to the science target in the sky. Finding a natural star for this role is unlikely. So, to make the correction of the atmospheric turbulence possible everywhere in the sky, for all possible science targets, engineers came up with the idea of projecting a powerful laser beam into the sky onto the sodium layer to create an artificial star. By measuring the atmospherically induced motions and distortions of this artificial star, and making minute adjustments to the deformable secondary mirror, the telescope can produce images with much greater sharpness than is possible without adaptive optics. The new laser delivers 22 watts, which sounds modest compared to standard lightbulbs, but when emitted in a coherent way the beam is very intense (and powerful enough to require special safety measures during operation). The challenge of such lasers is to efficiently produce light at the particular wavelength needed to create the artificial star . The performance of these new lasers, once they are in operation on the telescope, will be of interest for future projects such as the European Extremely Large Telescope, which also has requirements for multiple laser guide star units. The new laser will form part of the 4 Laser Guide Star Facility (4LGSF), which is to be installed as a subsystem of the Adaptive Optics Facility (AOF) on UT4 of the VLT, to provide the AO systems GALACSI/MUSE and GRAAL/HAWK-I with four sodium laser guide stars (LGSs), as artificial reference sources for high-order AO corrections. The light from the laser consists of a main spectral line centred on the sodium D2a transition, containing 80% of the laser power, and two side bands equally spaced either side of the main line and each containing 10% of the laser power. The higher frequency sideband is resonant with the sodium D2b transition and combined with other properties of the laser can enhance the brightness of the artificial star by up to a factor of 2.5. A low-power infrared laser emitting at a very stable wavelength of 1178 nm is the first part of the process. The infrared light is then amplified in a high power optical amplifier utilising the Raman effect and then fed to a resonant cavity that doubles the energy of the photons, producing the desired 589 nm wavelength, which is perfect for creating an artificial star in the sodium layer.